Picture a family barbecue. Friends and family gathered in a backyard socializing and having a good time. There is music playing, a card game going, yard games are being played, and kids are running around. While tucked away in a corner, enjoying the fun around me, I noticed my five-year-old nephew walk up to his cousin and take a toy right out his hands as he was playing with it. The little boy screamed, and a small skirmish between the two of them ensued. The entire party kind of paused, and turned to check out the ruckus. Once everyone noticed that everything was ok, the party resumed. From a short distance, I watched my cousin discipline his five-year-old son. He didn’t spank him. He didn’t even raise his voice. When he spoke to his son he was calm, stern, direct, and firm. 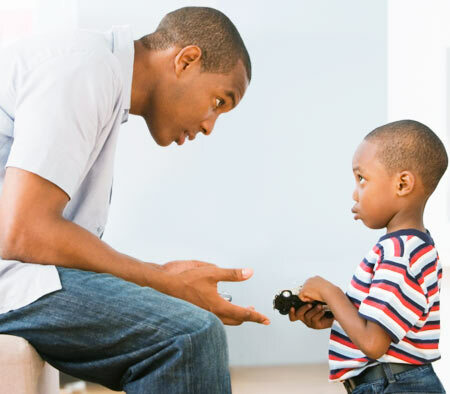 While redirecting him, he was teaching his son that what he did was wrong. He didn’t punish the act, he taught the moment. It was the best piece of parenting I’d seen in a while. Then it hit me! I was spanked as a child for naughty behaviors. I remember being the five year old boy that had the temper tantrum at the barbecue and was discipline for it. It was effective, as the spanking taught me not to do the behavior that warranted the spanking. Because my son comes from an abusive background, I am forced to parent through a different set of lenses. My son came to me at fifteen years old and, up until that point, every form of discipline my son encountered had been yelling and then something physical. My son was being wired to think that he was bad. Fast forward to now, when my son does something stupid or disrespects me in some way, my human nature kicks in and I get angry. So how do I rewire myself to meet him where he is? How do I teach while I’m emotional, to instill discipline? One of the answers to these questions is to remain calm and teach the moment. I don’t have all of the answers so pray for me as I search for a way to spare the rod and save the child. I am a constant work in progress. As a foster dad, my approach can’t be the same for every child. However, I must be consistent in practicing patience and understand. Every child deserves the safety and security of a loving home. my husband and I attended your talk at Central Wesleyan Church last night. Thank you for sharing your encouraging story.